Following the Asus M50V, the much anticipated M70V has finally become available but will it be able to compete with other well known manufacturers? The "inner workings" of the M70V is what distinguishes it from its predecessor, the M50V. 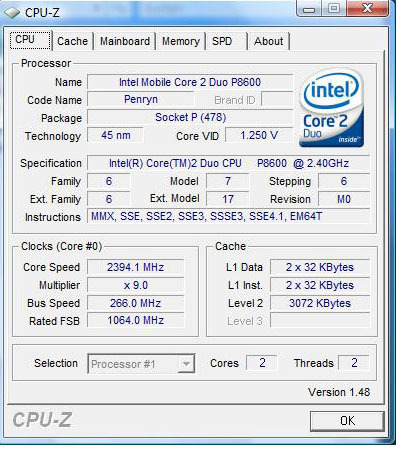 The M70V is built on a Core 2 Duo P8600 with 2.4 Ghz. However, with a huge 17 inch display the M70V has been downgraded from the M50V, displaying a resolution of only 1440x900, versus the M50V's 1680x1050 resolution on a 15 inch screen. The first thing we regretfully noticed in the M70V was the lack of Blu-Ray support, even though we praised the M50V for it. However, it must be kept in mind that Blu-Ray support in standard configurations is still rare. Concerning the graphics card, the M70V is equipped with a nVidia GeForce 9650M GT with 1024 MB VRAM just like it's little brother. 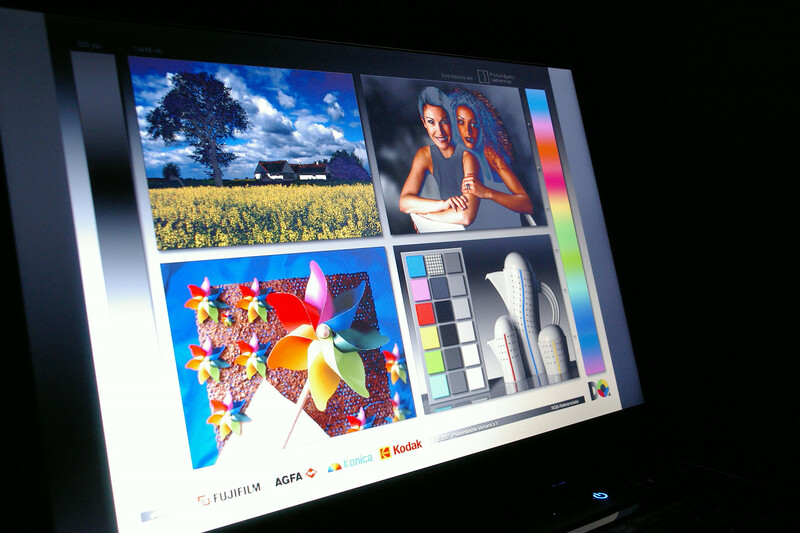 The graphics card allows for a 1440x900 resolution on the 17 inch display with WXGA+ Glare. 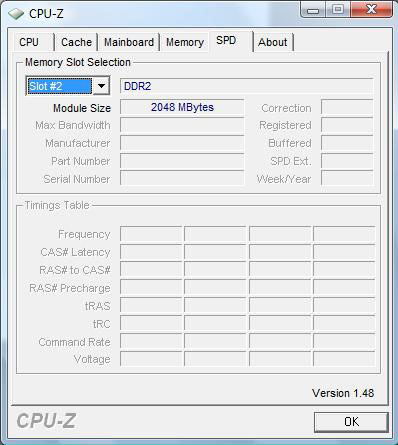 Furthermore, the Asus M70V allows for the use of more than 4 GBs of RAM and has a 500 GB hard drive which consists of two 250 GB Seagate hard drives (Seagate ST9250320AS). This is plenty of space for starters. 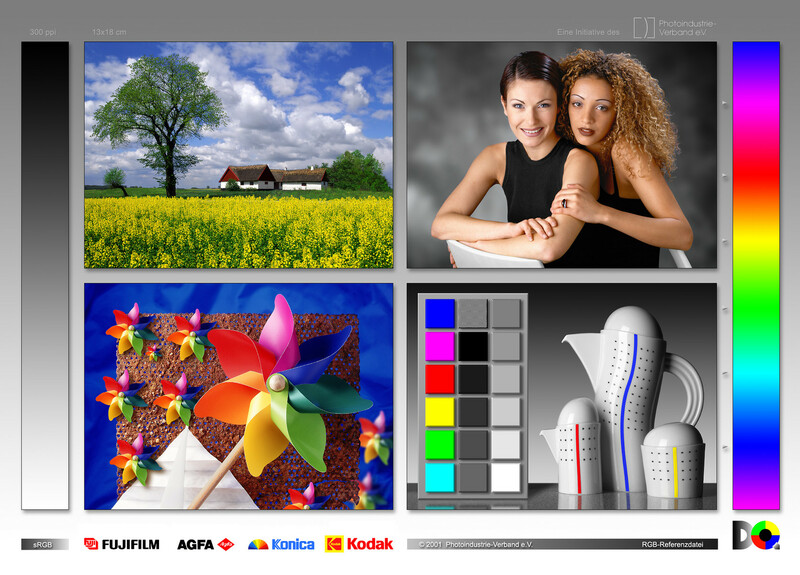 These tests are specifically run on the M70V model number M70VN-7S067C. 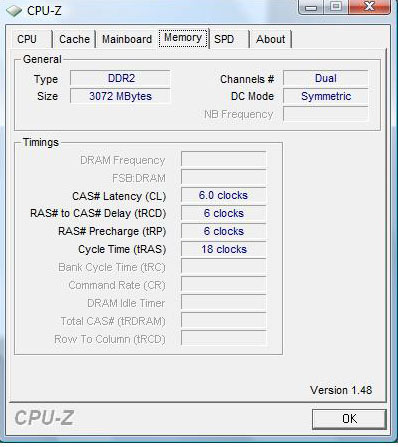 The other models (Asus M70VN-7S066C or M70VM-7U047C) are different in the CPU speed, graphics card or the maximum resolution. 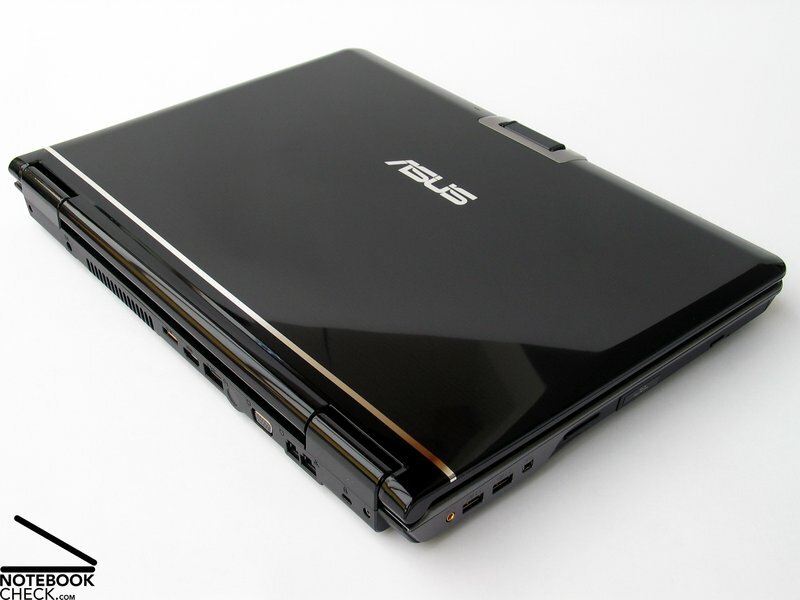 For example, if someone wants the M70V with Blu-Ray support and a resolution of 1920x1200, he will want to pick up the Asus M70Vn-7T068C. The top quality "Infusion Design" seen in the M50S and M50V is back in the M70V. The case is made up of accented chrome with a mirror finish. The typical "Infusion" grey and black line pattern also returns, along with the high grade lacquer gloss finish. The M70V, M70S, and previously tested M50V and M50S, all give a very noble first impression both through the use of a high gloss finish with well chosen coloring and with Asus' classy original Infusion design. Not only does the appearance itself collect extra points, but also the stability and feel of the Asus M70V gets a bonus, too. Even if you recognize the liberal use of plastic at first glance, it still passes our tests with satisfaction in regards to stability, which gives the laptop a very sturdy impression, another pass in our practical tests. Even during a pressure test, the deformation of the plastic is negligible, at most. The one exception is the back side of the display lid which begins to buckle even with the slightest pressure. Lifting the Asus M70S using the front edge is easily done without effort. Also, there was no grinding or scraping heard during any of these tests. Praise goes for opening and closing of the display as well. 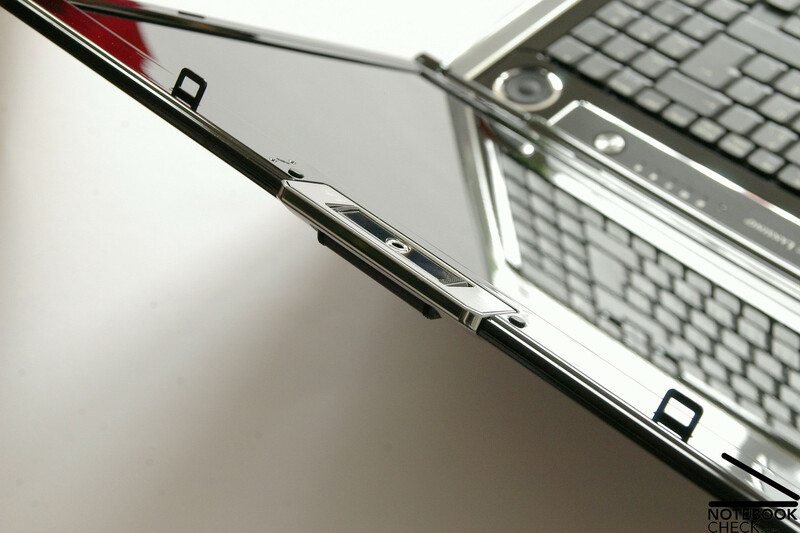 The display is built with a double latching system that firmly holds the laptop closed. The clasp is easy to use and uncomplicated to open, thanks to the ample, smooth moving and easily accessible push button on the front of the notebook. It takes a little bit of force to open and close the display, but without the squeaking or grinding of the hinges, which firmly hold it in place with the slightest wobble. 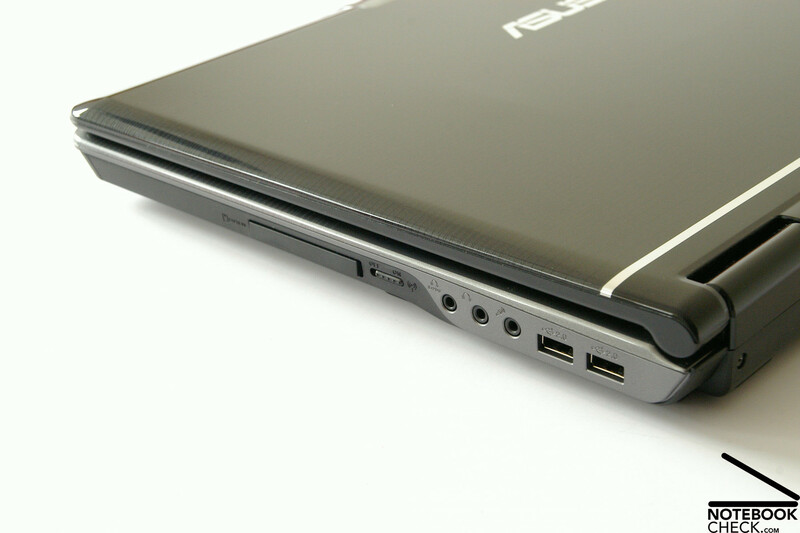 The overall positioning of the ports in the Asus M70V is rather user friendly. 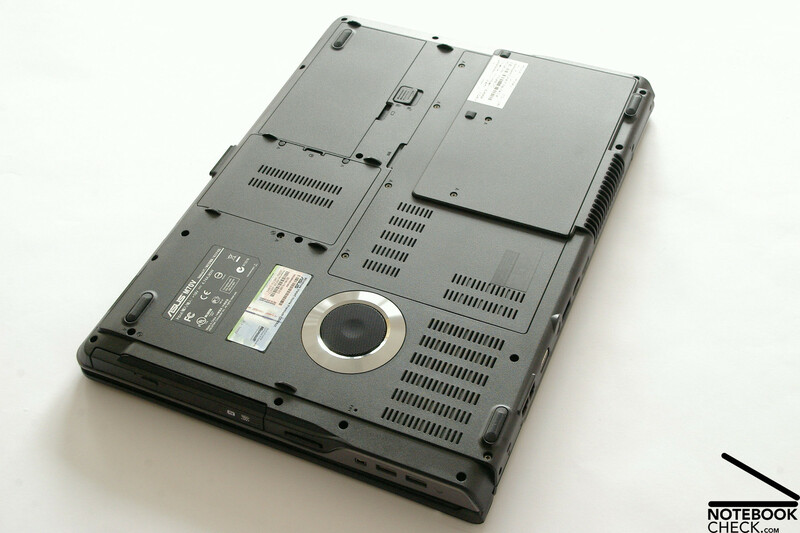 While the front side continues to be free of ports (with exception to an infrared port), some of the ports previously offered on the sides of the laptop have been pushed to the back. The backside is now made up only of the most frequently used ports. 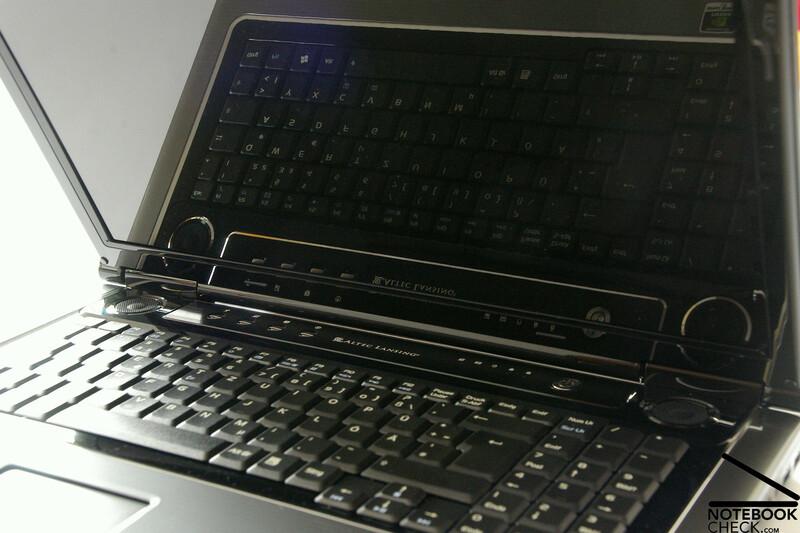 Therefore, the working area around the laptop remains free of cable clutter, even by maximum port use. 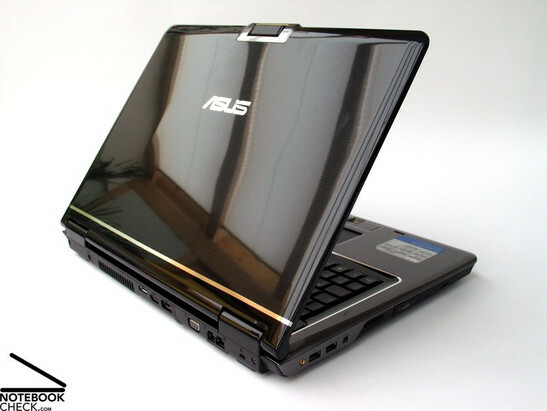 In detail, the Asus M70V's left side features include: USB 2.0 ports, Firewire, a card reader and finally the optical drive on the front side. The right side houses two more USB ports and audio ports (headphones, microphone, S/PDIF). 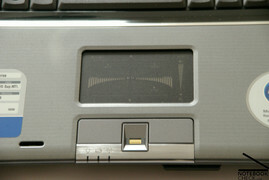 Furthermore, the right side also has a hardware switch to deactivate the WLAN and an ExpressCard 54mm slot. As previously mentioned, backside of the laptop consists of the typically most frequently used ports, like the power cord. Next to the vent is an HDMI port, allowing connection to a seperate HD monitor. 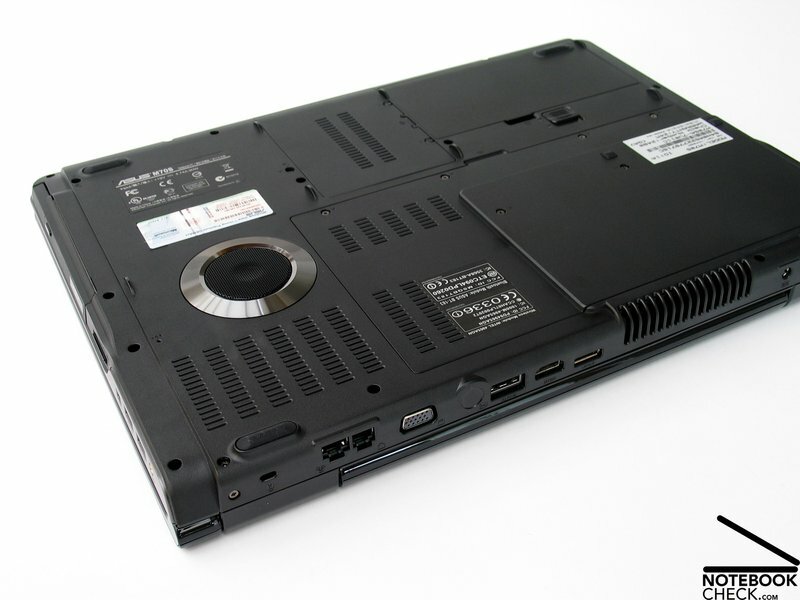 The M70V is also equipped with a eSATA port, to transfer data from another laptop or an external hard drive. The analogue Standard-VGA port compliments the range of video interface. And finally, we can still find a LAN and Kensington port on the backside of the laptop. The communication interface is also well equipped. The Realtek RTL8168C(P)/8111C(P) Family PCI-E Gigabit Ethernet NIC LAN caters excellently to a cable bound network connection, while it is with the Intel(R) WiFi Link 5100 AGN module also WLAN ready and has standard-n-support for first class data communication. That's not all, to finish up, the bundle als has infrared support and Bluetooth V2.0. 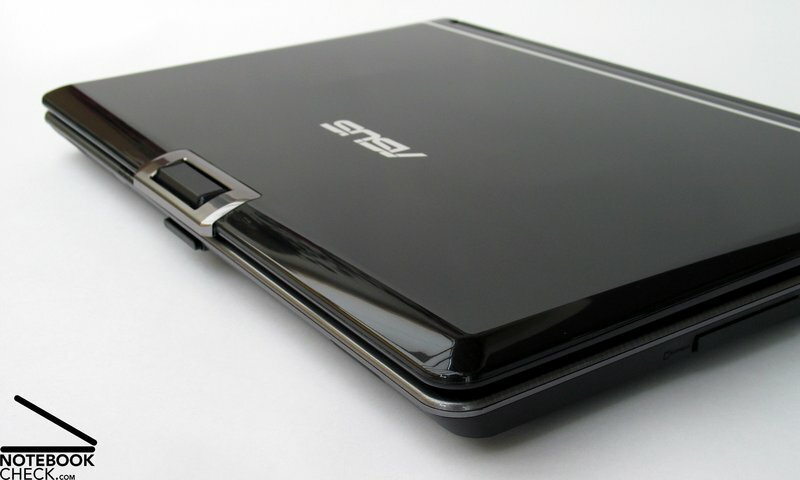 In terms of data security, the Asus M70V comes with a fingerprint reader (located between the two touchpad buttons), with which one can restrict access and manage password entry. 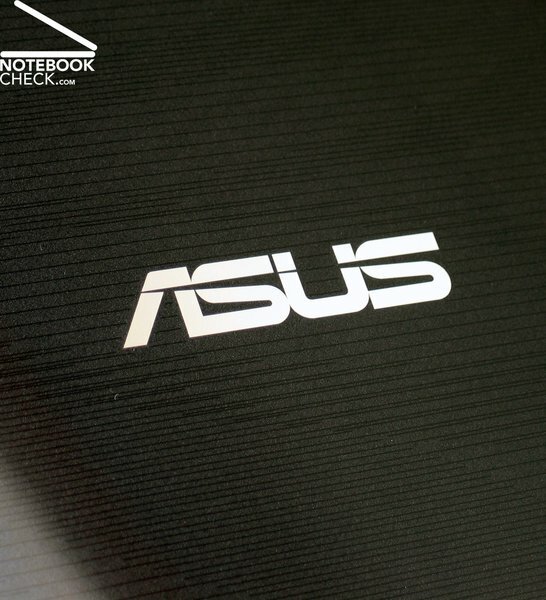 For mobile users the Asus M70V includes a laptop bag, which leaves us with a good impression. There are no surprises in the Asus M70V keyboard layout. Due to the added numpad they keyboard is positioned slightly off center. However the good news is the key dimensions are 18x18 millimeters and the enter key is nearly twice that size, while the shift, backspace and tab keys have been enlarged. Even the arrow keys were easy to use, despite their slight shrinkage. Regarding how it feels to type, the Asus M70V offers a somewhat jerky feel with a unique pressure point. The noise level while typing is typical of a laptop keyboard with a slight muffled sound when the keys are pressed. The volume is within reason by casual typing, although excited vigorous typing will be significantly louder. The touchpad of the M70V is definitely one of the highlights of our notebook tests: we're talking about the dual-mode touchpad. 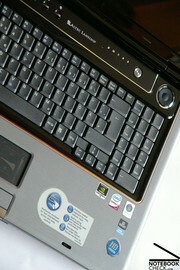 With a light tap in the right top corner the touchpad can be switched between two modes. The default mode is of course the usual control of the cursor. 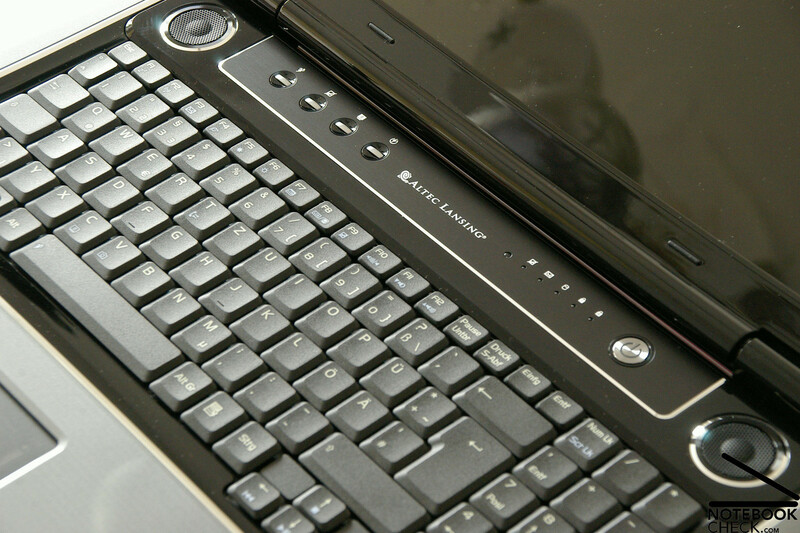 By switching to the second mode (multimedia mode), the background lights up and the touchpad turns into a multimedia control center. 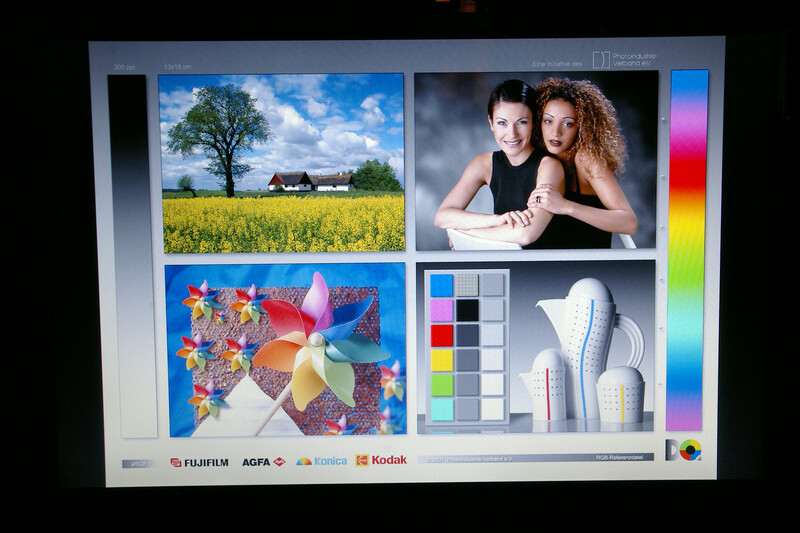 Here, by a single tap of the illuminated icons the different multimedia functions can be easily controlled. This includes volume, display brightness, play, pause, etc. 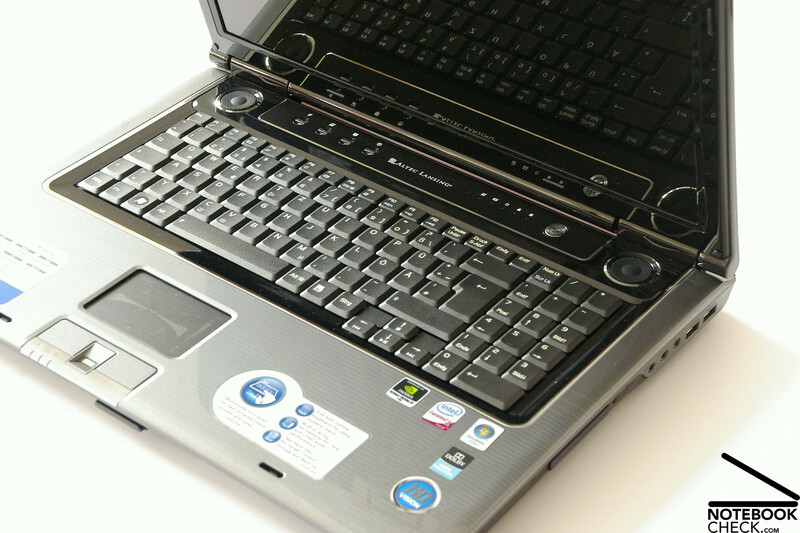 Just like most other multimedia laptops, the Asus M70V also has additional buttons in between keyboard and display, including the option to switch profiles or a quick deactivation of the touchpad. The present Asus M70V that we have has a 17 inch display and a very strong, reflecting WXGA+ display, which has a maximum resolution of 1440x900 pixels. 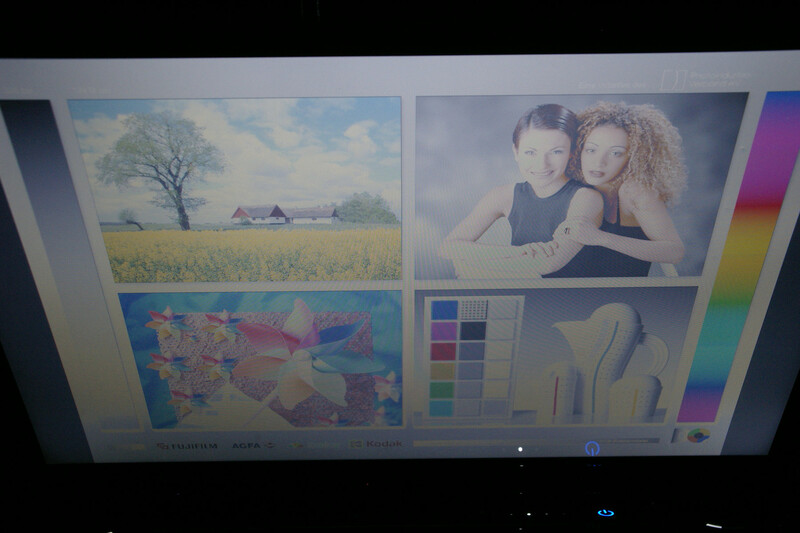 The demonstrative picture is clear and sharp, both in Windows and in games. The colors are deep and vibrant thanks to the glare type display, which also allows for games like Crysis or World in Conflict to be played without any streaks. Just like with the previously tested M70S and M50S models, the M70V also has an integrated brightness sensor, which adjusts brightness based on the surroundings. This feature can also be easily and quickly tuned on or off with the FN+A function. To measure the brightness we will obviously turn this feature off and manually set the brightness to the highest level. This way we can measure our values without interference. The measurements were between 173.8 cd/m² in the lower left corner and 213.8 cd/m² in the upper central area. The brightness of the other panels are satisfactory. 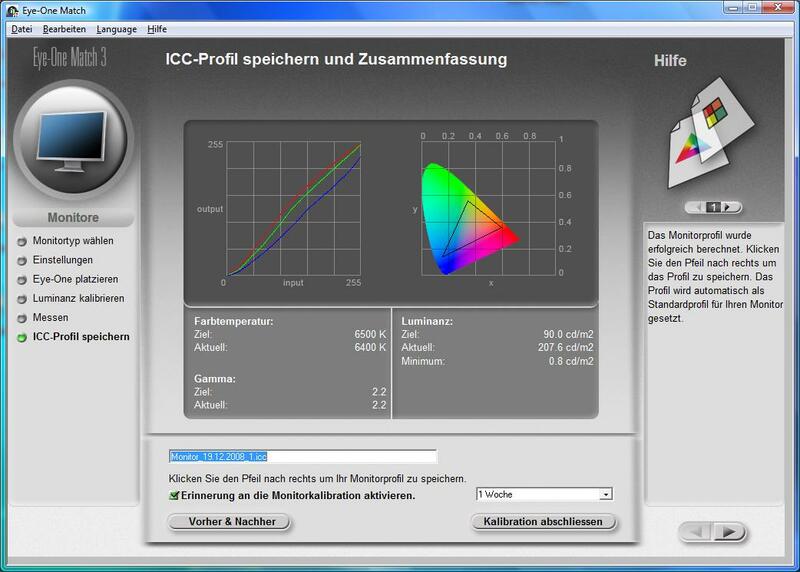 With an average display brightness from 192.65 cd/m² the results of our tests are in good standing. 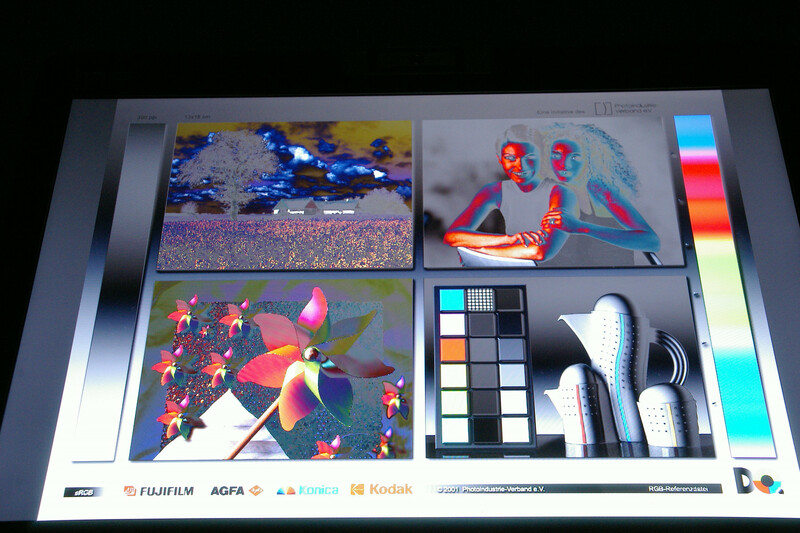 However, these results and the glare display make the M70V a bad choice laptop for use outdoors. The viewing angle is rather dissapointing and has slightly tarnished our thus far good review. Regardless if you look at it from the horizontal or vertical planes, the picture becomes darker or discolored as soon as you move the viewing angle just too far. The viewing angle is quickly cleared-up with a quick sitting adjustment. We were on board with Cinebench R10, too. Single rendering resulted in 2631 points, multi rendering had 4873 points, and the shader awarded 3561 points. 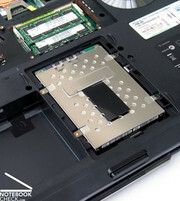 The Asus M70V offers two hard drives, each having 250GB gross storage capacity. All together the notebook has 500 gigabytes total memory capacity. Obviously a small portion of that is reserved just for system data. However there is plenty of space for audio and video data and should there be an emergency, there is an eSata port, making storage capacity pretty much endless. 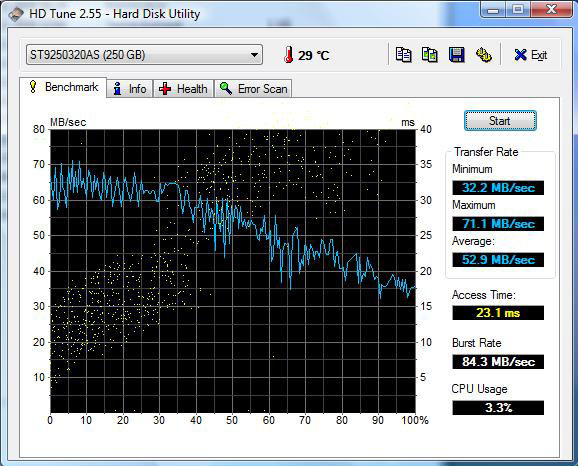 The HDTune benchmark test shows that the two Seagate ST9250320AS hard drives display good performance in data transfer rate. With an access time of only 23.1 milliseconds, these hard drives are significantly faster than either 5400 revs per minute hard drives and the faster 7200 rpm models. The various components of the Asus M70V have shown promising (game) performance so far. Not to thank the least is the nVidia GeForce 9650M GT with one gigabyte of VRAM. Even though the 9650 GT isn't a high-end graphics card, casual gamers can still fully enjoy a wide range of games due to the laptops vast resources. 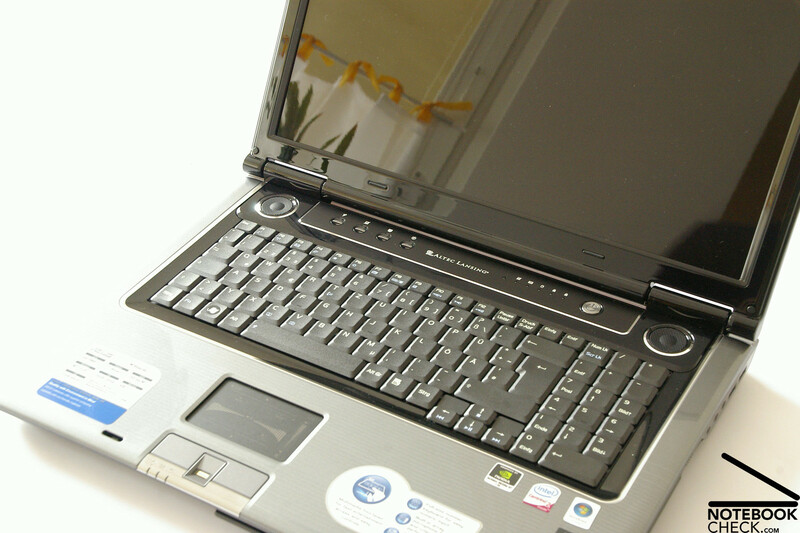 The Core 2 Duo P8600 with 2.4 Ghz and four GB DDR2 memory are plenty to load games on the M70V. Futuremark 3DMark tests will accomplish a better comparison. 3DMark01 and 3DMark03 are hardly a challenge for the Asus M70V. Our tests resulted in 23209 and 12933 points, respectively. 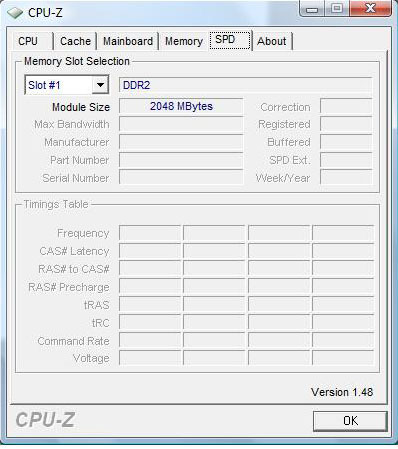 The same goes for 3DMark05, in which the Asus M70V received 8385 points (CPU 12500 points). However, 3DMark06, being the most recent release, was making the M70V sweat. 3DMark06 got the M70V a total of 4880 points, and for the CPU a score of 2172 points. Even the game test results were in large part positive. Although a few years old, Doom 3 on the highest setting runs at an average of 58.4 FPS, and is fluidly playable on the M70V. The real-time strategy game World in Conflict is playable, as long as you don't use DirectX 10 settings. A fluid, enjoyable game can be played at an average of 38 frames per second with a 1024x768 resolution. An average of 31 fps were still possible even in the native resolution of 1440x900 pixels. 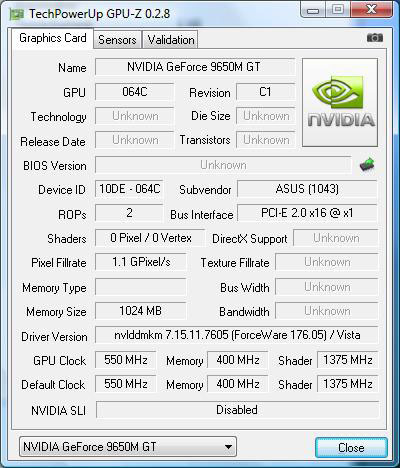 The nVidia GeForce 9650M GT is just too weak for the use of DirectX 10. The refresh rate was only 13 frames per second with a resolution of 1024x768. And by 1440x900 only 9 frames per second were possible. The shooter Crysis from Electronic Arts is known for its high system requirements. Even though Crysis runs fluidly at 50.87 / 48.97 fps (GPU- / CPU-ranking) with a resolution of 1024x768 on low settings, the performance of the Asus M70V in terms of detail are modest at best. With the settings at medium details at the same resolution, fps were meager at 22.2/21.37 fps (GPU- / CPU-ranking) possible. Lastly, under high details, the M70V could only manage 12.28 / 11.46 fps (GPU- / CPU-ranking). Overall we can say that the Asus M70V has the capability to play games. However you should be able to deal with low detail settings or even reduced resolution. Unfortunately the Asus M70V is anything but quiet. In idle mode we measured an average of 34.9 dB(A) up to a maximum of 35.7 dB(A). This isn't all that bad, but the competition have made their laptops a lot quieter while idling. Under a work load, the speed of the fan increases to the maximum and so does the sound. Therefore the M70V emits an average and maximum of 43.4 dB(A), which is clearly audible. The good thing is that the sound of the fan stays constant, and after a while you won't really hear it anymore preceiving it as background noise. Another point to make is that the loud, hard work of the fan isn't without purpose, it's there so the Asus M70V can stay cool. But more on that in the next section. In regards to warmth, the Asus M70V shows its best side. The temperatures in all nine zones remained green. A maximum of 32.4 degrees Celsius in the upper central area is a very positive result. The other central areas are hardly at the 30 degree mark, and the rest of them are considerately lower. Even the back side looks rather good in terms of heat development. The maximum measured temperature was 35.9 degrees Celsius, which is a bit warmer than the topside. More or less it is possible to comfortably work in your lap, except for the fact that it has a 17 inch screen, which makes it less mobile and more of an at-home desktop replacement. All in all, we can say that the Asus M70V keeps a cool head in intensive working situations, except at the cost of noise emissions. (+) The maximum temperature on the upper side is 32.4 °C / 90 F, compared to the average of 39.3 °C / 103 F, ranging from 21.6 to 68.8 °C for the class Gaming. 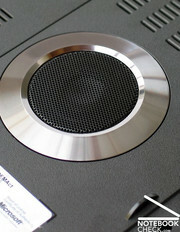 Asus went back to the Altec Lansing sound system seen in the earlier M50 and M70 models. These built-in speakers (and therefore sound quality) is an excellent choice by Asus. 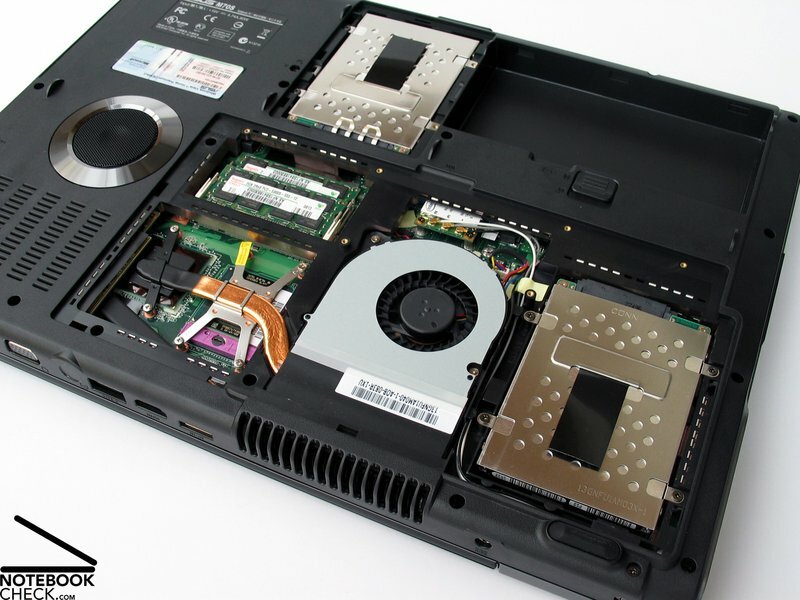 In the bottom of the laptop is an integrated subwoofer (which we painfully missed in the 15 inch models). The Asus M70V has a great deep bass sound, even though the sound itself could have been a little fuller. Regardless if the volume is low or at maximum output, the sounds are clean and crisp in nearly all types of music. From classical music to pop music, or even a DVD of acoustic background music in games - these speakers are a necessity. Even though mobility isn't the top issue of the 17 inch Asus M70V, battery life still proves to be quite significant. We tested the battery life with the BatteryEater tool. The Reader's test was done on the lithium ions battery with a capacity of 74.88 Wh (5200 mAh, 14.8 volts) - with the WLAN deactivated, screen brightness reduced to minimum and everything else placed into power-saving mode. The laptop ran for a good 294 minutes, which is 4 hours and 54 minutes. Then we gave the laptop a heavy work load while running BatteryEater Classic, at maximum brightness and with activated WLAN and Bluetooth. The Asus M70V ran for a good 115 minutes (with a little energy to spare) before it started nagging for a power outlet. Likewise the battery lasted for 204 minutes while playing a DVD at maximum brightness; surfing the internet using WLAN lasted 169 minutes. This laptop has nothing to hide from it's competition. 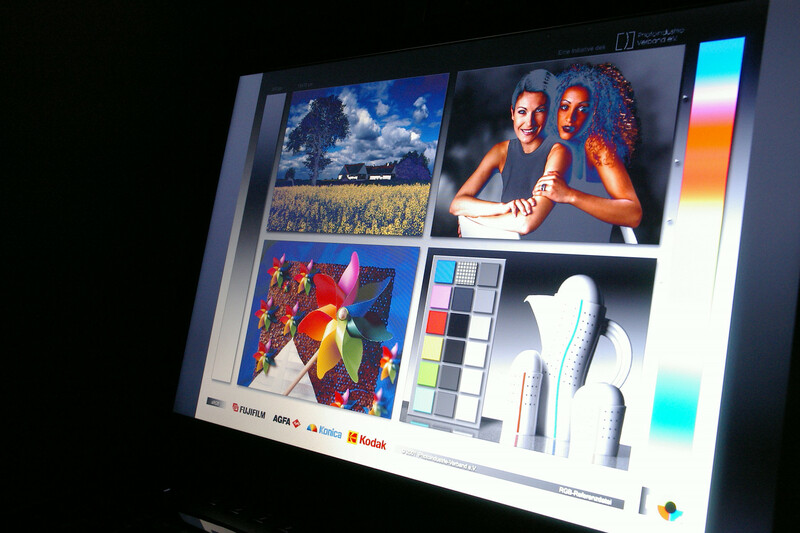 The Asus M70V displays multimedia talent on many levels. The chrome and glossy surface gives an accurate first impression for the extend of this notebook. Mention worthy praise that needs to be addressed is the user friendliness of the positioning of the ports; HDMI and eSATA ports both help make nearly anything possible. 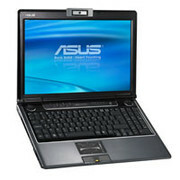 Asus M70V's configuration is the epitome of a multimedia laptop. The hardware tests prove that the configuration is everything a multimedia laptop and desktop replacement should be today. 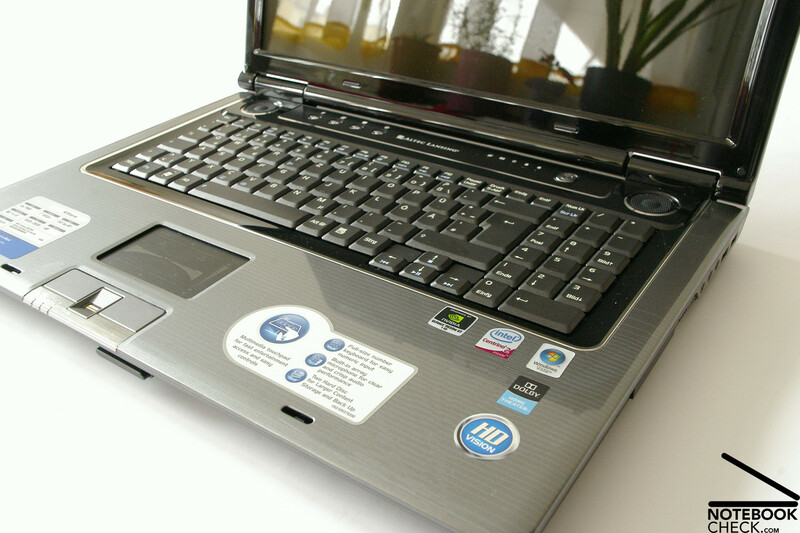 The M70V is equipped with: Core 2 Duo processor, 9650M GT graphics card from nVidia, four gigabytes of DDR-2 RAM, a 17 inch WXGA+ display with a maximum resolution at 1440x900, and lastly 500 gigabytes of hard drive space. 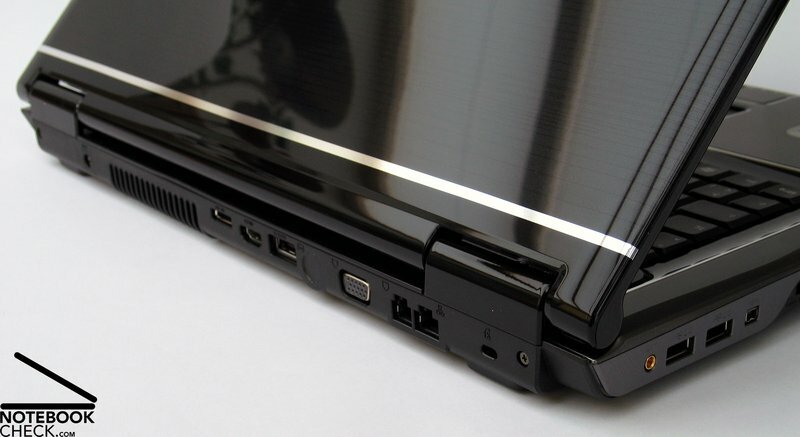 The Asus M70V collects even more points with the conviniently located ports. The Asus M70V hardware lives up to the performance. 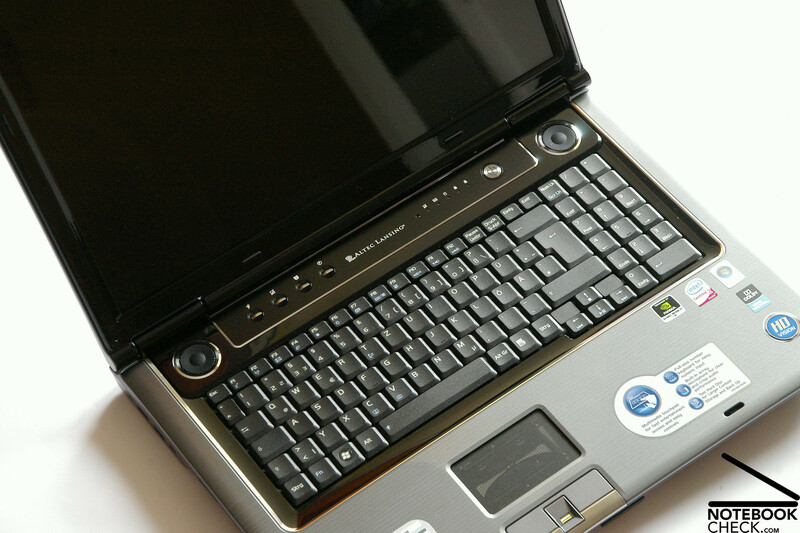 The laptop is built to do more than just everyday tasks including for example surfing the internet, sending emails, and watching DVDs and listening to music. The Asus M70V caters to the casual gamer, too. Although intensive games aren't possible at the highest detail intensity and resolution, the sacrifice of the two make it possible to play resource intensive games like Crysis. 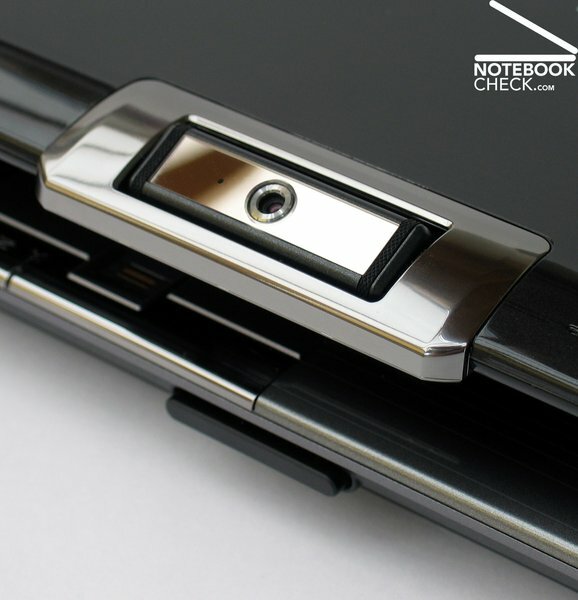 Included is a swivle webcam and a fingerprint reader, which adds even more to the multimedia package of this laptop. Unfortunately the extremely reflective display makes it impossible to use this laptop anywhere outdoors. However, the audio system from Altec Lansing gets an especially good grade. The speakers and subwoofer allow for flawless musical enjoyment. Regarding the laptop's sound emissions, we're really not sure how we feel. On one hand, the laptop stays relatively cool both in idle mode and under a heavy word load. On the other hand, the system fans can get especially loud during games. While the fan noise is audible, it is constant and quickly forgotten. Thanks to the comparably big 5200 mAh Lithium Ion Akkus, the Asus M70V has the capability to run on battery power for quite some time which offer great test results. We were very satisfied with the four hours and 54 minutes in power saving mode and two hours 49 minutes with the use of WLAN. The M70V has nothing to hide from competition. 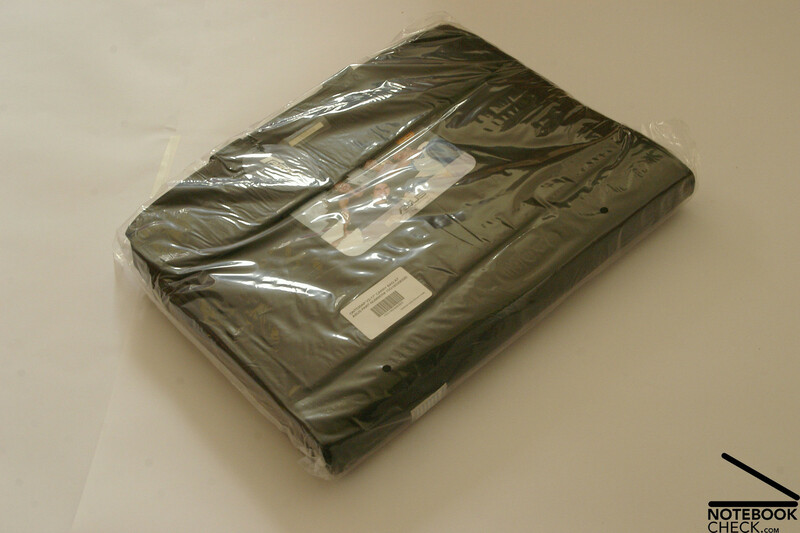 Ending on a final note, the laptop comes with a high quality laptop bag and a small notebook mouse. 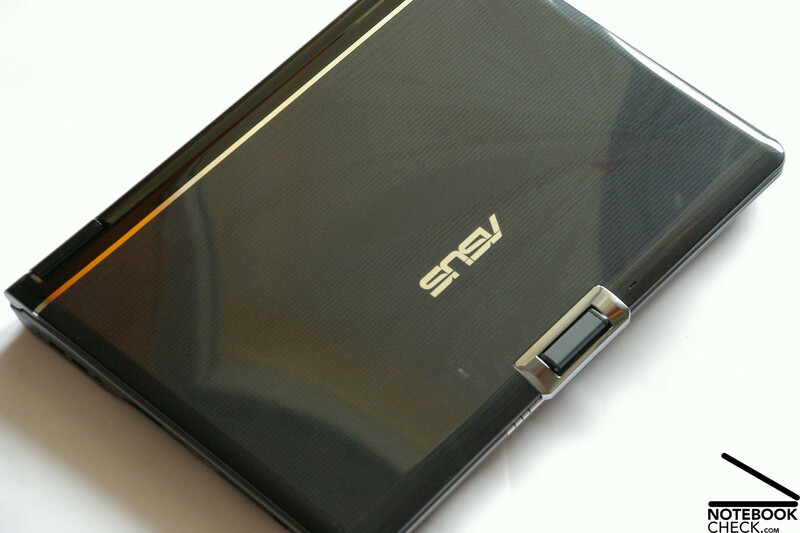 The Asus M70V shows its overall attractiveness closed. The level of warmth on the case stayed in the green zone. ...each have 250GB of space, which totals to a nice 500GB capacity. The very reflective display delivers a contrasting picture with excellent brightness. 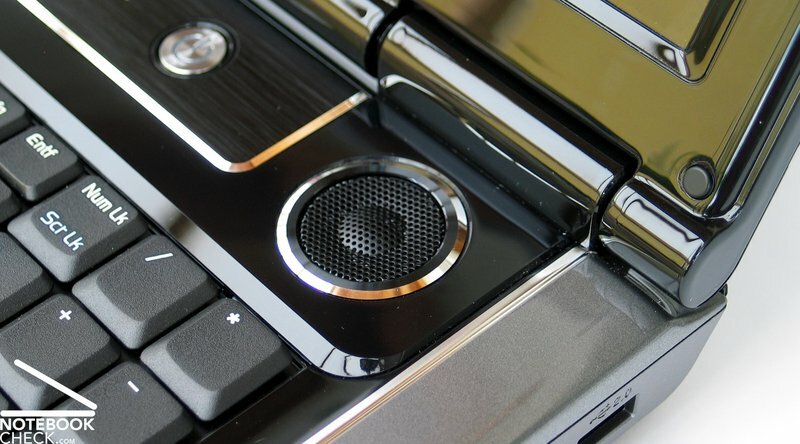 The touchpad offers a dual mode function, which offers a slew of controllable multimedia functions. ...with its own numpad on the right side for number entry. For example, you'll find the most often used ports in the back or on the back sides. 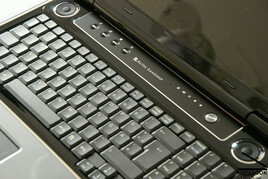 ...the layout of the ports themselves make this notebook especially user friendly. The intergrated camera is ideal for business use, and the utilization can be locked by the use of face authorization. ...and is very stable under physical pressure. The base unit is designed with numberous chrome lines and coated with an equally nice high gloss. ...which gives the notebook a nice unique appearance but is quicker to get smudges and fingerprints on it than competitive models. ...and a subwoofer on the bottom, which together offers first class audio playback. The Infusion design makes a very fine first impression. The glowing touchpad in multimedia mode is just as good looking. 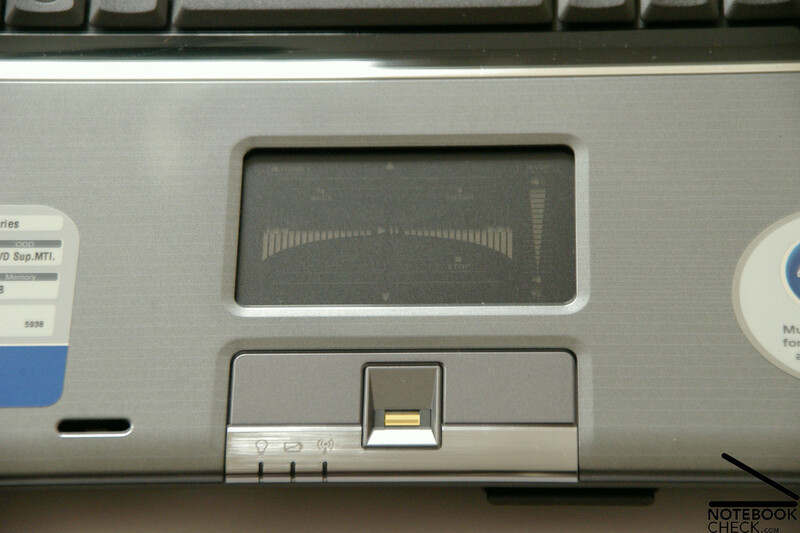 The dual mode possibility of the touchpad. A pack of headphones to drown out the loud noises of the fans for when the laptop is under a heavy load. Asus sticks to a well-tried concept and scores. Other than the Asus M70S, the Dell Studio 17 and other desktop replacement notebooks with a 17 inch screen in the same price class.